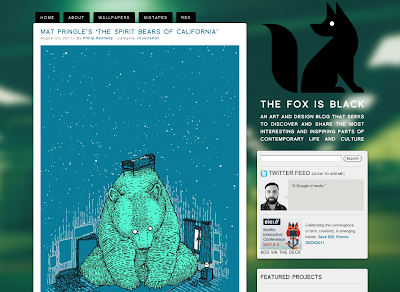 Mat Pringle: The Fox is Black digs Bears that are Blue! I wasn't sure whether to post this or not but I just wanted to thank the guys at The Fox is Black (ace art and design blog) for being so kind as to say very nice things about my Californian Spirit Bear series. I had an inkling something was afoot when my [holding steady at] 39 followers suddenly jumped up over night to a nose-bleed high 43 followers! Low and behold I had featured in their esteemed blog - read the article here. And then read some more of their articles and download a mixtape or two - it's all splendid stuff.